First on the bill tonight is a new Norwich band, Shrapnel, who only formed in April 2009. They take to the stage in front of a small crowd which grows steadily during thier set as more people arrive, with the room being around two-thirds full by the end of their set. Shrapnel play fast powerful thrash metal and headbang furiously as they play. The singer is often a blur of hair as he headbangs. A band that cites Exodus as one of their influences, they are clearly thrilled to be opening for Exodus tonight (and on the rest of this UK tour). The crowd clearly enjoy Shrapnel tonight with plenty of headbanging going on in the audience. A good solid performance from this young band, who will have made some new fans here tonight. Next up are Glasgow band Man Must Die. More death metal than thrash, they still fit nicely into tonights lineup and the crowd are soon headbanging and a circle pit quickly forms. The singer has a more growly vocal style than the other two bands, and the rest of the band pump out some powerful riffs that keep the crowds interest for their half hour set. By the time they finish their set, the venue is full as people arrive in time for the headliners, Exodus. Last tonight are the headliners - American thrash metal legends Exodus. 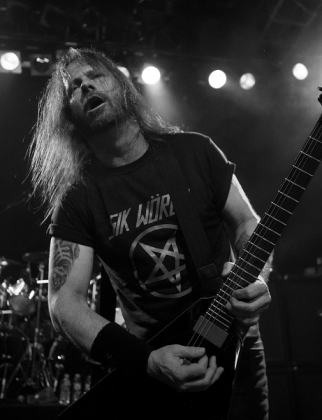 Formed in 1982, Exodus have been making great Thrash metal ever since their first album in 1985. Tonights set includes two tracks from their debut album "Bonded by blood" ("Bonded by blood" and "Piranha"), and one track from their 1988 masterpiece "Fabulous disaster" ("The Toxic Waltz"). Tonight isn't just about the classics though - we get three tracks from their latest album Exhibit B:The human condition ("Good riddance", "Beyond the pale" and "The ballad of Leonard and Charles"). Tonights show is the last night of a six night headline tour of the UK, intended as a warm-up for their European tour with Kreator, Death Angel and Suicidal angels. The thrash legends are on top form and almost instantly whip the crowd up to a frenzy - the first crowd surfers coming over the top during the first song and keeping the security team very busy. Its not long before Exodus have a huge circle pit opening up and taking up a large part of the venue. The fans may have enjoyed the support acts, but most were clearly only really here for Exodus as the cheers between songs prove. A fantastic performance by these thrash metal veterans, showing the younger bands they have inspired just how the pro's do it.